I’m writing from my bed in my Ehrenfeld room/cell (I am still yet to buy furniture) and surrounded by the stuff I am going to be taking to Namibia. Today. I’ve checked, double-checked and triple-checked my kit, my documents and everything else, and I think I should be good. I’m catching the train to Frankfurt in a couple of hours, and from then on to Johannesburg, and Windhoek. I’m pretty nervous, so this post may be a little frenetic. But that isn’t what this post is about. As you may or may not be aware, Karneval happened recently. It’s Cologne’s Mardi Gras. To attempt to put this succinctly, the entire city goes off its rocker (to use my supervisor’s expression) for about a week, everyone gets drunk and wanders around in costumes. It’s a massive mashup of culture, a mix of Cologne’s Catholic tradition and the pagan past. Parades are everywhere, and there’s always a party. I don’t know whether it’s that Germany has some sort of wholesale cultural repression going on most of the time, but when they open the valve, it is wild. I’ll admit that when Thursday came around I had no idea what was about to hit. I’ve drunk more in the last week than I think I did in the last year, met some amazing people, and even managed to speak some German. Yes that is me. Yes it is terrifying. To be honest, after so long, I am sick of the bloody sight of it. Goodness knows what my flatmates must think. I have temporarily retired it to being mounted on the clothes horse in the hall, until I shall call upon its services again. It was a good conversation starter, though. It’s not even a costume. Magnificent. I only regret you can’t see his tail. I partied with sailors, pandas, Scotsmen (shouty drunk Germans in kilts are brilliant) and still others not definitively something or other, just using the excuse to wear the loudest, most garish outfit they could cobble together out of their wardrobe. Most of Karneval’s many, many evenings were spent at what I am now sure is my favourite place in Cologne, a bar called Qlosterstüffje (I know, I can’t say it either), which was great because not only was it full of weirdos like me, but all the profits went to keine jeck es illejal (no one is illegal) a great and worthy cause supporting refugees in Germany. Never have so many drunk so much for such a good cause, I am sure. I even knew some of the songs they were playing, although it being Karneval it meant that there were about ten cheesy ones all on loop, and all of which I can probably hum right off the top of my head. Nobody minded, though, least of all me. The oddest moment had to be when the entire bar sung about kicking the bourgeoisie up the arse and establishing full communism, for no other reason than the DJ put the song on. I couldn’t stop laughing. The anthem for the local football club (1 F.C. Köln) was also played liberally. It is rather bizarrely sung to the tune of Runrig’s Loch Lomond, so for a full evening I just thought the bar was making an effort to make me feel at home, while I brazenly sung the Scottish words as everyone else was singing about football. There is another traditional Kölsch song sung to the tune of Highland Cathedral, but I didn’t pay that much attention to it at the time because I simply assumed I was delerious. Yes. Everything you’re thinking. It’s really like that. What the guys in blue are doing is throwing large bars of chocolate, with surprising force, at a crowd of people with their arms up. 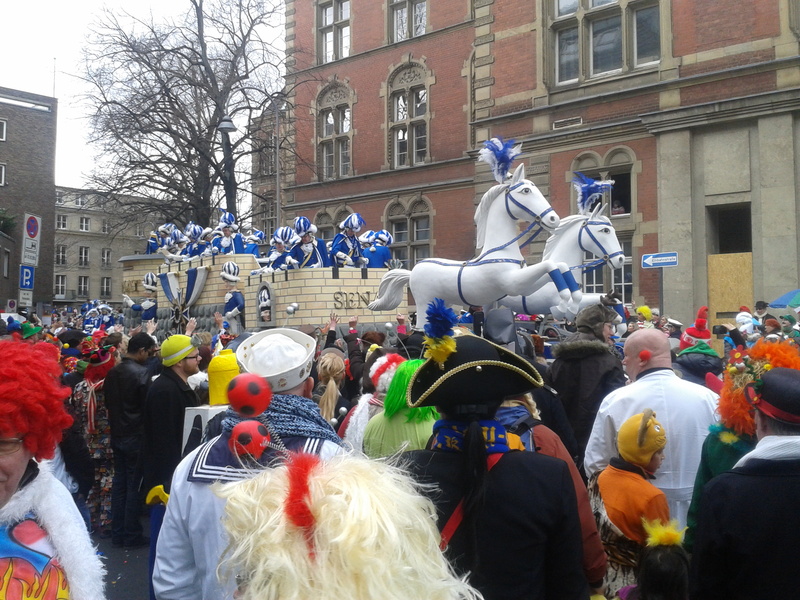 All of the costumed Kölners below are shouting “Kamelle!” (“sweets” in the Kölsch dialect). This goes on for about three hours as the parade makes its way into town. When I say that, I mean that if you stand in one place the procession will take that long to pass you. Even better, the Ehrenfeld parade passed right by our open window. My flatmates and I spent the afternoon in the first-floor flat downstairs shouting out the windows and dodging hefty chocolate bars as they threatened to brain us. All of this takes place in a slightly beery haze, mind you, so even when there’s a direct chocolate hit it doesn’t hurt too much. 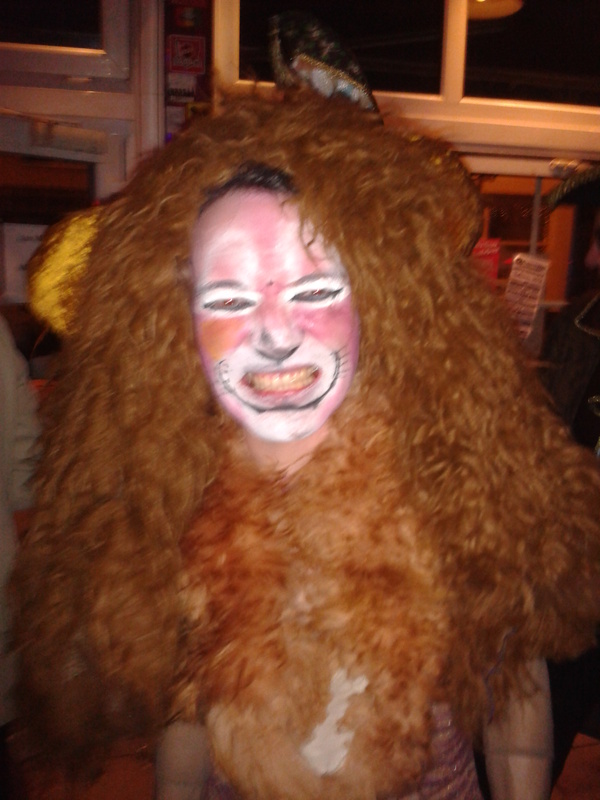 So after all that, there was only one evening of Karneval left. The last night was a bit more subdued than the ones before. I’m not sure if it was Cologne’s collective hangover, or just mine, but I didn’t feel up to as much of a party on the final night. There was, however, a ritual burning of an effigy. Once again finding myself in Qlosterstüffje, a torchlit procession made its way solemnly out the door. It was accompanied by a figure on a stretcher. We followed as it wound its way through the darkened alleyways to a platz beyond. There, the crowd laid the figure upon the stone, and we fell silent as sheets with collective chants were handed out. It was dark, and I can’t pretend to know everything that was said, but a whispered translation from a friend gave me the gist of it. This figure represented all of our sins from the past year, the sins that Karneval was to see the end of. The poem was read, and we chanted, whooping and hollering before the figure was set alight. As it burned, we leapt through the flames. I’m pretty sure I’m totally sin-free now. 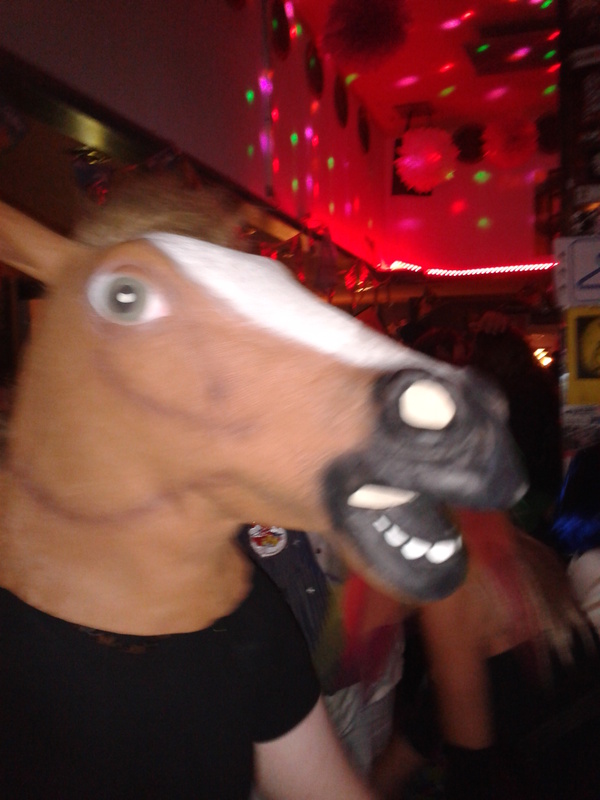 Or at least I was on Wednesday, when I woke up with a smoky jacket and the sort of hangover I might have called “bad” before Karneval. Cologne feels different now. I’m not sure whether it has changed, or I have, but I certainly feel we’ve got to know each other better over the last couple of days. I might be nervous about heading to Africa for a month, but I’ve taken in so much culture here in Cologne that I’m pretty certain I could write a PhD just about the general weirdness that seems to overtake this part of Germany every now and then. I love it here. See you in Namibia. Tschuß!